I want to die with nothing. No money. No energy. No capacity to laugh, smile, love, hurt, fear, persevere. To die with nothing would mean I have used everything. I have laughed more than my body was meant to laugh, smiled more than my cheeks would let me, hurt more than my soul would allow, love more than my heart could bare, fear more than my whits could handle, and persevere when others would quit. To die with nothing would mean I have given my money to those who need it, and given my energy to causes that deserve it. 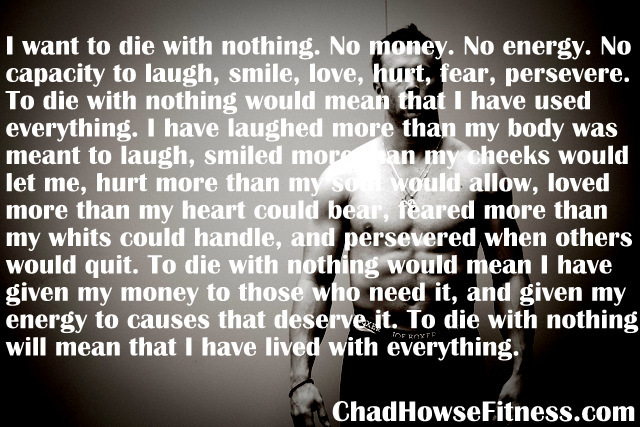 To die with nothing will mean that I have lived with everything.